Marjorie's Busy Corner: Opposites Attract!!!!! IHey folks!! 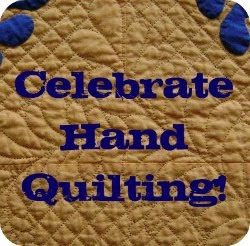 !......my day to take part in this blog hop organized by Marian over at http://www.seamstobesew.com/. Have you had fun so far???? We are really lucky to have the great giveaways too!! Fat Quarter shop and DJ Inkers have been so generous. 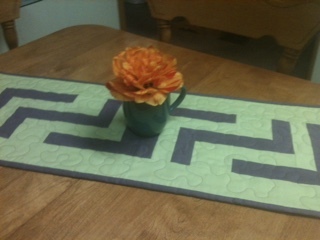 Now for my part in this one, I made a little table runner. We were allowed 3 colours, but I stuck with 2, and I did keep it under the required size. Another look at it....with my tulip blossom in a large cup. 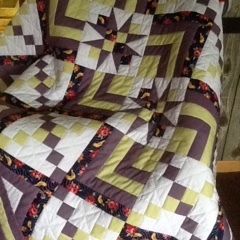 And here is the quilt that the idea came from....and the true colour of the fabric. Amazing what lighting does, eh!!! To get in on the giveaways, please go over to Marians blog with the link above. Thanks for visiting!!! I love the simplicity of the look of using only two colors. Your runner is great, and so is the quilt that inspired it! Lovely runner! It could work with so many different styles of decorating just by picking colors that go with the room. That's a fun pattern! Makes for a great quilt or runner. I like the pattern. I love straight lines. Love your simple style table runner, it is really good looking! I like them both, the runner and the inspiration. I like the floral fabric added to the quilt design. It makes a very interesting focus. Thanks for being part of the hop. your runner is lovely. i love the colors you put together. thanks for sharing. That is a fun table runner! Love the visual impact of those two soft colors. I love the quilt beautiful!! What a fun runner. My first choices were those colors too, but something else caught my eye this time around! LOL!! I love the quilt you did. That is a beauty! Oh yes, lighting does make a difference. 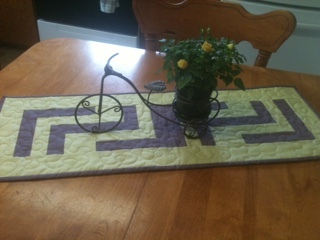 Great quilt and table runner! Very interesting color combination - I like it! Thanks for sharing. I would never have thought to use thhose 2 colors together, but they look great! Your table runner turned out great. Thanks for sharing! A very modern design Marjorie, and another lovely project. The colors together are perfect, yet subtle. The quilt that give it it's inspiration is beautiful. I love being able to visit and seeing your inspirations. You truly are an amazing lady. Thank you for participating in Opposites Attract. The table runner is very pretty. Your quilt is fabulous. I like the use of only two colors. Very pretty runner. There is so much beauty in the simplicity of the design and how well those two colors go together. Lovely project. Nice design on topper--wish the colors had showed better, they go so well together, sort of a split-complementary without the yellow-orange. I like it! I love the results!!! 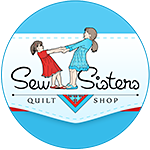 I have loved that quilt for so long and now the topper is gorgeous too. Purple and green is my favorite color combination, and your lovely runner takes advantage of these colors so well. Thanks for the eye candy! Love your runner. Love the quilt, too! Simple and great looking. Love the runner. I am making a few for the upcoming holiday. very nice runner and they say the camera never lies maybe that was n the good old black and white days, I took a photo of a purple block I made the other day and it came out as a true blue! Love the runner and the color choise.